Product Source An E. coli strain that carries the Phusion DNA Polymerase gene. Phusion high-fidelity DNA polymerases are composed of a DNA-binding domain fused to a Pyrococcus-like proofreading polymerase. Because of this, Phusion DNA polymerases produce PCR products with very high speed and accuracy. Also, Phusion DNA polymerases are tolerant of various inhibitors, allowing for robust amplification with minimal optimization. Phusion DNA Polymerase is an ideal choice for cloning and can be used for long or difficult (GC-rich) amplicons. Phusion high-fidelity DNA polymerases have become the choice for even demanding applications like massively parallel high-throughput sequencing of whole genomes. High-Fidelity DNA Polymerases are important for applications in which the DNA sequence needs to be correct after amplification. Its unique structure, a novel Pyrococcus-like enzyme fused with a processivity-enhancing domain, increases fidelity and speed. Phusion DNA Polymerase is an ideal choice for cloning and can be used for long or difficult amplicons. With an error rate > 50-fold lower than that of Taq DNA Polymerase and 6-fold lower than that of Pyrococcus furiosus DNA Polymerase (1), Phusion is one of the most accurate thermostable polymerases available. Phusion DNA Polymerase possesses 5´→ 3´ polymerase activity, 3´→ 5´ exonuclease activity and will generate blunt-ended products. 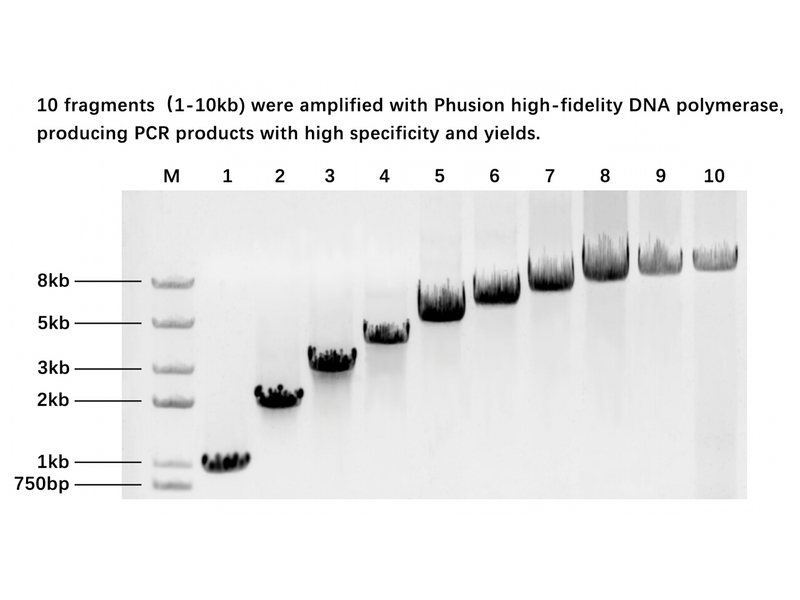 Phusion DNA Polymerase is supplied with standard 5X Phusion Buffer, which can be used for complex or GC-rich templates. Reactions can also be optimized using the provided DMSO. 1. 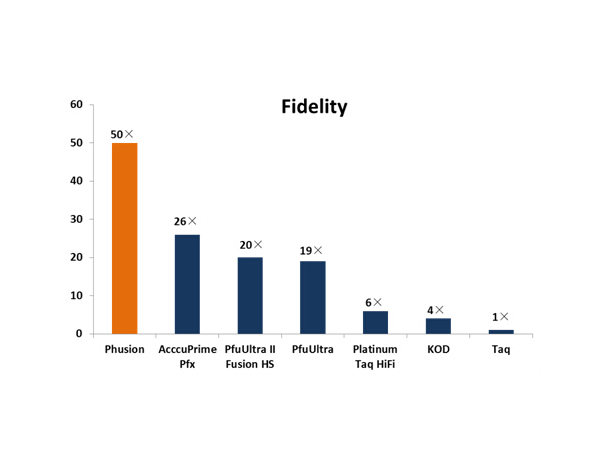 High fidelity—up to 50x more accurate than Taq; up to 6x more accurate than Pfu DNA polymerase. 2. Enhanced robustness—fewer reaction failures and minimal optimization. 3. Improved yields—high product yields with minimal enzyme amounts (0.5–1 U/50 μL reaction). 4. High speed—increased processivity allows shorter reaction times (10X faster than Pfu). 5. Versatile – Can be used for routine PCR as well as long or difficult (GC-rich) templates.